Debbie arrived last night for the Soap Weekend Intensive with her famous Soapsicles in hand (and towing a cutie pie husband and two kids too!). She can visit every year if she brings such great hostess gifts. This one is Choco-Berry Swirl. It’s an edible delicious scent- YUM! 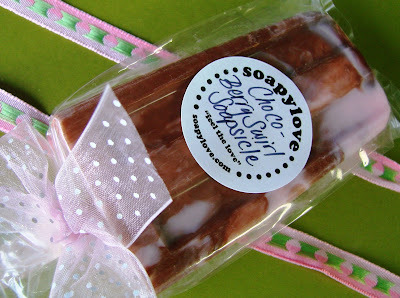 To see more fabulous Soapsicle creations, check out soapylove.com It even came with a custom soap dish, made just especially to fit a soapsicle (sorry, no photo – maybe later). Yes, I am wondering how she does her Writer’s Block too. It’s a creative head scratcher. Get your Writer’s Block Soap here. She’s even getting custom soap dishes made that fit the soap perfectly. OK, so I’m looking at all the pictures, scrolling through your blog and I’m going, “OMG! Everything is so great, where can I comment first?” What a fun time you all had. I am so impressed by it all, but especially the moon and stars soaps. Oh, and yes. The cupcakes. And here’s my Midwest “sigh”! If you have any more workshops next year, maybe I can make it – they sound like SO MUCH FUN!! E, you could come up for just a day at half price if you want to pop in. It’s $150 per day. Let me know if you want to pop in. 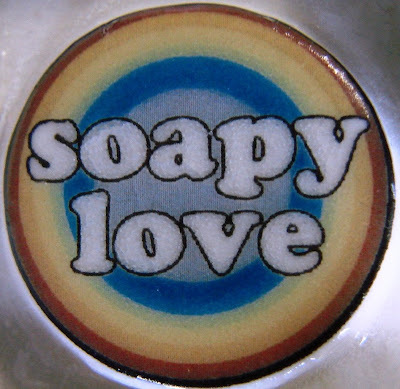 =) It’s a long drive but … SoapyLove is the last day and she is one adorable soapy gal. 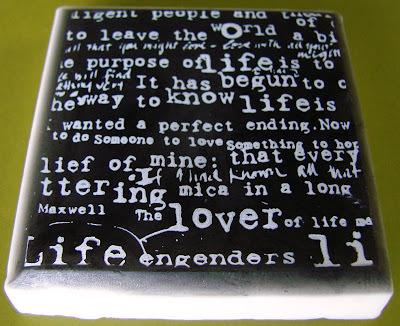 The writer’s block soaps are very creative. I already ordered mine and can’t wait for them to arrive. I am very curious to know how she did them too. Maybe one day she will share but for now we will just have wonder and enjoy her creativity. Oh don’t tempt me!! How much was is again?? Lol! I doubt the babe can make it through a weekend. Lol! Have fun!! Here’s my East Coast *sigh*! Can’t wait to see all the fun pix.